Sometimes you just want to make something that is super easy to throw together. I’ve been sick all week and my ability to stand over a stove and go through the trouble of cooking a meal is almost non-existent. So I’ve resorted to an old stand-by, this dragon fruit chickpea salad. It requires minimal ingredients, even more minimal (minimal-er?) prep time and still feels like I’m eating a meal (instead of the pre-packaged microwavable stuff I’m tempted to make when my kitchen, which is only 30 ft. from my bed, seems like a marathon-like distance away). Dragon fruit is delicious if done right–I’m convinced that those who don’t like it have only had it served to them in a weird sauce or something, it’s pretty innocuous. Dragon fruit is found in most Asian supermarkets (and other produce-heavy stores) and, much like watermelon, it is refreshing and light, more water than pulp and absorbs much of the flavor around it. In this salad it works nicely to break up the starch and fat textures of the chickpeas and avocado, respectively. The lime in the dressing helps brighten the dish too and also has the added bonus of preventing the avocado from browning too much. I’ve thrown some wasabi sesame seeds on top of my version here, I like the spice it adds to the dish, but it is totally not necessary. You can also add your own topping depending on your mood, fresh thinly cut radish would be good as would some nori. For the Salad: Combine all of the ingredients in a bowl and toss well. Enjoy! Makes 3 servings. 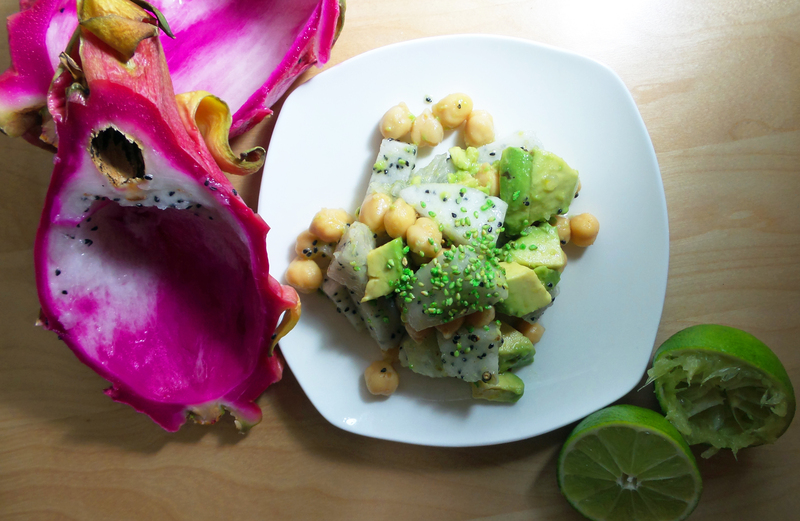 This entry was posted in Mains and tagged avocado, chickpea, dinner, dragon fruit, gluten-free, lunch, soy-free, vegan, vegetarian, wasabi sesame seeds. Bookmark the permalink.